I first saw her at the St. Landry Parish Animal Shelter. We were there filming and she was cowering inside her dog house, growling and baring her teeth at everyone who passed by. Obviously driven by fear my heart broke for her. She had only known a life of neglect and now she was in a cage surrounded by strangers and the stress of a typical animal shelter. Being filled up ourselves with our own rescue, I began to leave the shelter but couldn’t get her out of my mind. So I turned around, bailed her out and brought her home with me. Named after a tribe of Louisiana Indians that lived in our area, “Attakapas”, is a hottie and that means she will need an experienced dog handler. She is great in the house but outside…..she’s on the move! 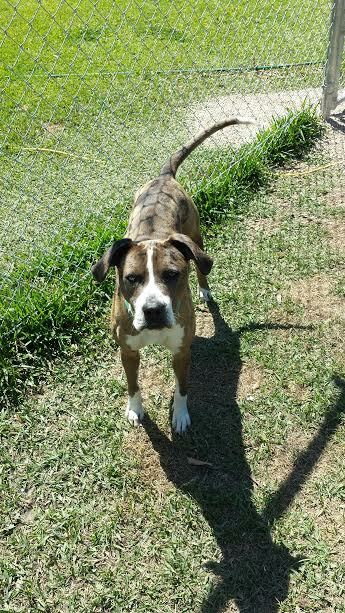 For now, we appreciate any sponsorships we can get toward her expensive heartworm treatment. This girl definitely has my heart. She’s a bad a$$ chickie!